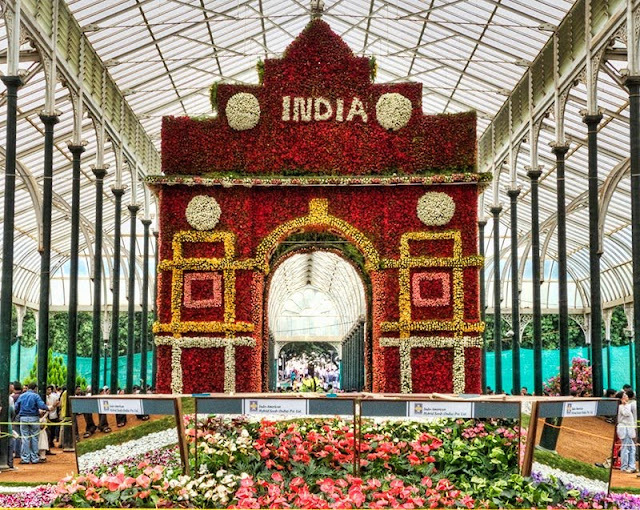 The 205th Republic Day Flower Show will commence at Lalbagh Botanical Garden from 15 January, 2019. You can book tickets online for flower show event at Lalbagh, Bangalore scheduled in Republic day celebration week. For the first time, Government of India has started online tickets for Republic day event (Flower Show) 2019 scheduled this year. The timings and ticket fares have been notified below with the link that will redirect you to the official Republic Day ticketing website. All eligible adults, students and school children are eligible to attend the week long 10 days show scheduled from 15 to 26 January. The Chairman of Mysore Horticulture, Shri SP Sadakshariswamy announced that Flower Show event shall poise many attractions this year with the beautiful event organized in the Republic day weekend. According to sources, the flower show will be approximately 50 ft long, 28 ft wide and 40 ft wide that signifies the replica of Red Fort in Delhi. The tickets will be distributed online and offline at the venue. The Glass House attraction shall remain the theme for this year's Red Fort. A source reported that 200 varieties of flowers shall be on display with 25,000 pots up for glam preparation. The approximate cost of this year's show is reported to be 1.8 crores and expecting an average of 50 lakhs of profit. Though the Flower Show in Lalbagh gives a tribute and honour to our respected soldiers, it signs an emotional eternity for everyone visiting the space. It is also stated that nearly 3,15,000 flowers will be coming in fresh from Sikkim, Darjeeling and Ooty to occasion this huge celebration. All these fresh flowers will be up for display right at the first day of the Flower Show starting on 15 January, 2019. Last year, the Government of India with Karnataka Government had displayed the 15-foot tall Bahubali statue that grabbed all the eyeballs in the extravagant floral event hosted nationally. It was stated that nearly 1.5 lakh flowers of different varieties were used to design the statue with the floral theme. Last year, the theme was a huge hit in the Southern part of India as people know the importance of the presence of Lord Bahibali. You can visit the site - Lalbagh Flower Show Tickets online sale. Currently Government of India is promoting cashless transactions across the country which shall remain the theme for ticket fees collection this year. If you are looking forward to visit the event, Kindly drop in your comments below for further processing of your request and getting free passes for the event. Please take note of the timings in the mentioned below. The timings of the Flower Show will be from 9 AM in the morning to 5:30 PM in the evening. All are invited to visit the show by Government of India. President of India - Shri Ramnath Kovind will be present at the inauguration day of the festival to launch the occasion. If you are in need of free passes for the event, kindly send your request in form of comments below. We will definitely provide you with a valid pass for entry into the show with your family. This is a fantastic event every year twice organised by Horticulture society of India. It is a privilege to witness the event. Kindly arrange a pass for me & my wife for this event. Thanks. I witnessed Republic flower show from last 5 years and don't want to miss great show this year too, love to be there. Republic day flower show has blossomed as the fresh flower spreading it's radiance and has become a must attended event year after year. Thumbs up to those hard working organising staff making the show a world class event. Me and my family are regulars(4 persons),since your good organisers has offered free passes,we consider it a privilege to get passes....keep up the good work..Cheers!..H.N.Vinaya Kumar.